World Populaton: What If Nearly 7 Billion Lived In One Megacity? What if the world’s population of nearly 7 billion people lived in one giant megacity? Tim De Chant from Per Square Mile has created a graphic that attempts to answer this question. The following graphic represents the world’s population concentrated into areas of the United Sates, according to how densely populated various world cities are. Included cities are Paris, San Francisco, New York, London, Singapore and Houston. The difference in density is quite amazing. 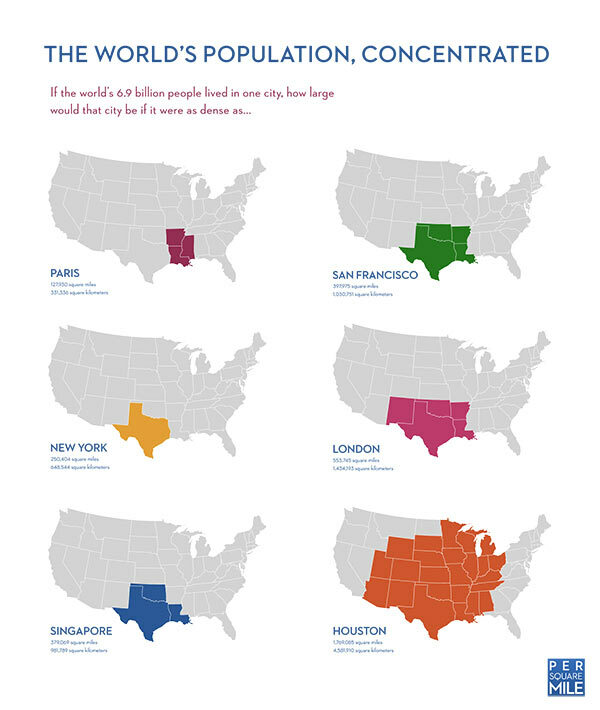 For instance, look at the difference between the density of Paris and Houston! This is quite a timely graphic, as the United Nations Population Division has recently predicted that at some stage in 2011, the world’s population will hit 7 billion. 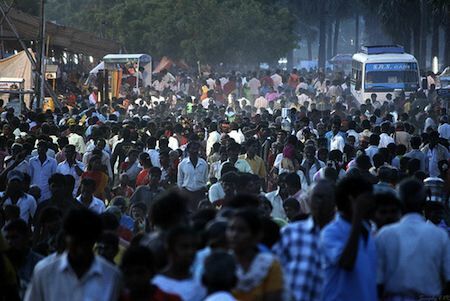 World population is currently growing by about 80 million per year! Back in 1800, world population was only about 1 billion. It climbed to 2B in 1930, 3B in 1960, 4B in 1974, and 5B in 1987. It reached 6 billion as recently as 1999. Some good news is that although world population continues to rise at an astonishingly rate, that rate is actually beginning to slow down. According to researchers, it’s not because people are dying at a faster rate, it’s because people are having fewer children as populations become more affluent and educated. Fewer children are dying at an early age from diseases such as cholera and smallpox, and consequently, people have been having fewer children. As the title of this blog, THE9BILLION, suggests, it is estimated that world population will reach 9 billion by around 2050. It’s then expected to level off. One of the daunting questions that a population of this size brings up is: how will we be able to feed 9 billion people sustainably? In addition, the fast growing population adds to some other increasingly urgent issues, such are climate change, pollution, and water resources. It remains to be seen how we’ll address these significant issues in the coming years, but I’m confident we can do it. Humans are resourceful. I believe that in the 21st century, one of the key drivers for humanity will be the rapid move towards a more sustainable world. Makes David Wingrove’s books seem all the more far-sighted, doesn’t it? Sorry to say I haven’t read any of them yet. Which one out of the 8 should I start with? Water too isn’t that big a problem – though we may need to encourage people to collect water instead of relying on dams in places where it doesn’t rain. I think climate change is the big one. If we need to move millions of square miles of soil because the location of rainfall alters this will be a big deal. I think we could do it, but it would take some major changes. Sorry, missed you comment earlier. I’ll def check that book out! Climate change is definitely going to change the way we do things, especially combined with this massive population we are heading for in less than 40 years now.